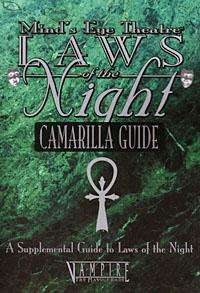 For five centuries, the Camarilla has been the guiding force of Kindred society, pitting itself against any who would defy it. The curtain of the Masquerade has been drawn across the stage of the Kindred. Under this veneer of tradition and gentility, the Jyhad moves in point and bloody counterpoint. It is about elegance and predatory civilty, lies and secrecy. It is about a curtain ripped away for the first time in 500 years. From the powers of the elders to the sect's brutally effective justice, from the mysterious Inconnu to the powers of the archons, the Camarilla stands revealed. Here are the revised rules for elders, expanded Disciplines and new Merits and Flaws for character creation, all for your Mind's Eye Theatre game.